Join us on Shabbat morning at 9:00 am for a fascinating and inspiring class on Kabbalah. Gain a Kabbalistic perspective on the inner spiritual drives that form the core of the human psyche; On the way, we'll explore: Heaven, reincarnation, purpose of life, good and evil, the spirituality of the Torah, the deeper meaning of Mitzvot, the mysticism of creation, end of days and more! Along with our fellow Texans, we are deeply saddened by the terrible school shooting in our neighboring community of Santa Fe, Texas. Chabad of the Bay Area staff and volunteers are organizing to reach out to the families of the victims and injured to provide comfort and support. If you or someone you know was affected by this tragedy and is in need of emotional or spiritual support please contact us immediately at community@jbayarea.org or 281-724-1554. The Rebbe taught us that when darkness strikes we need to increase the light. In the coming weeks we plan to lead an initiative with like-minded partners to find ways to increase the love and goodness in our society so that no one should ever have to endure this type of senseless tragedy ever again. In a few hours is Shabbat and on Saturday night the special holiday of Shavuot begins. Let's take our first step to increase the spirit of holiness and goodness with the lighting of the Shabbat candles before sunset tonight, and on both nights of Shavuot (from a pre-existing flame). On Shavuot we mark the 3,331st anniversary since the giving of the Torah. The Torah which brings to the world G-d's essential message to Man that we must live together in kindness and peace, that we must live for a higher purpose and seek to make our world a good and G-dly place. Come and join us as we re-experience Sinai, and recommit to its ideals, with the reading of the Ten Commandments from the Torah scroll on the first day of Shavuot at 11 am. Service followed by a delicious hot lunch featuring traditional Shavuot dairy delights (cheesecakes, blintzes, eggplant parmesan, lasagna, salads, ice cream and more!) RSVP (donation optional). Women and girls light holiday candles to usher in the holiday, on both the first and second evenings of the holidays. More info. 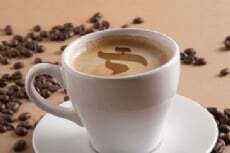 It is customary to stay up all night learning Torah on the first night of Shavuot. More info. All men, women and children should go to the synagogue on the first day of Shavuot to hear the reading of the Ten Commandments. More info. As on other holidays, special meals are eaten, and no “work” may be performed. More info. It is customary to eat dairy foods on Shavuot. Menus range from traditional cheese blintzes to quiches, casseroles and more. Reasons. On the second day of Shavuot, the Yizkor memorial service is recited. More info. Some communities read the Book of Ruth, as King David—whose passing occurred on this day—was a descendant of Ruth the Moabite. Book of Ruth. Some have the custom to decorate their homes (and synagogues) with flowers and sweet-smelling plants in advance of Shavuot. More info. Malka & Dovber Coates are pleased to announce the Bris of their great-grandson! Everyone is welcome to join in this special celebration of Jewish life and continuity! Come and join the Simcha! PS Please note, Tefillin and Breakfast will not be held at the usual time this Sunday morning. If you would like, come at 11:30 am for Tefillin. Join us for a Delicious Shavuot! 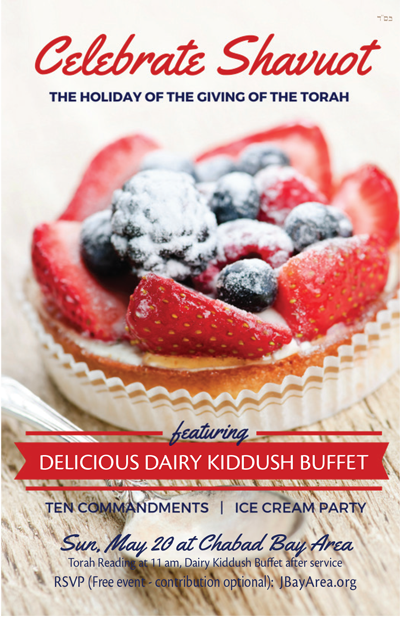 Featuring the Torah reading of the Ten Commandments followed by a DELICIOUS DAIRY KIDDUSH BUFFET including delectable homemade cheesecakes, salads, pasta dishes, blintzes, an ice cream bar and more! 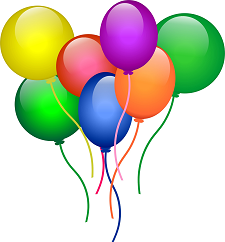 The baby naming for the baby girl born to Samantha and Shlomi Wolraich will be held this Shabbat morning! Join us for the service featuring the baby naming during the Torah reading! After the service everyone is invited to a buffet Kiddush lunch sponsored by Shlomi and Samantha Wolraich! 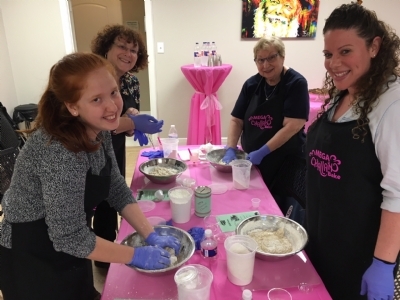 Jewish women and girls join together for an evening of hands-on baking, unity and inspiration! 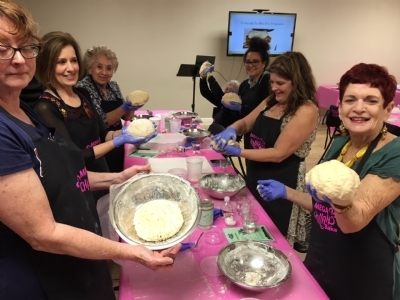 Discover the joy of creating your own Challah for Shabbat, from mixing, to kneading, braiding and topping! All supplies included. 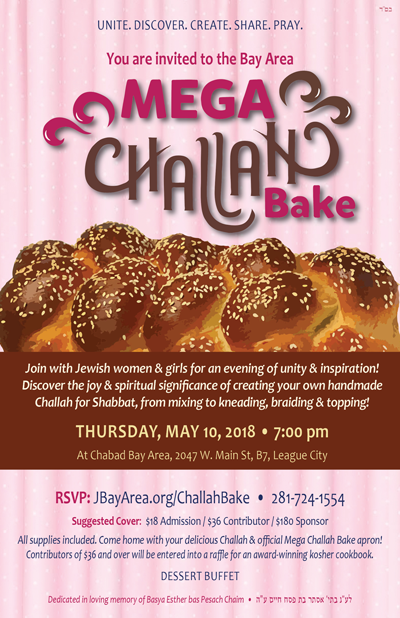 Come home with your delicious Challah and your official Challah Bake apron! Dessert refreshments will be served. Contributors of $36 and over will be entered into a raffle for an award-winning kosher cookbook.